Zhokhov Island in the Siberian High Arctic today exhibits inhospitably severe climate conditions, desolate tundra, and year-round pack ice in the surrounding sea. During the Early Holocene this same island was warm enough to host waterfowl species, birch trees, and year-round human residents who hunted polar bear and reindeer. The Siberian High Arctic’s Zhokhov Island is today covered in barren tundra. There are no trees or waterfowl. Even though today’s CO2 concentrations have eclipsed 410 ppm, Zhokhov’s summer temperatures may reach just 1° or 2° C above freezing during its warmest month (July). The island is surrounded by a sea of pack ice year-round, even in summer. During the Early Holocene, Zhokhov Island was open-seas accessible. It was teeming with waterfowl species that require 100+ days above freezing to breed successfully. Non-freezing days may reach only 60 per year today (Makeyev et al., 2003). Zhokhov Island’s terrain was overlain with birch trees. The northern limit for birch is today 600 km farther south (Makeyev et al., 2003). 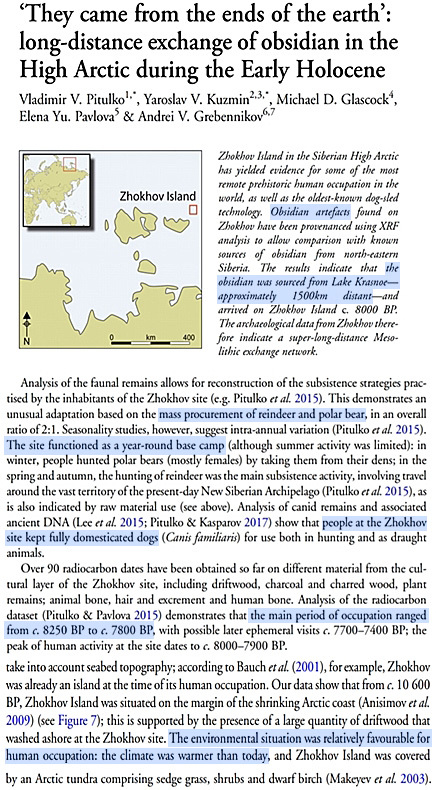 The island’s human inhabitants hunted polar bear and reindeer with blades made of raw materials (obsidian) gleaned from long-distance regional trading networks (Pitulko et al., 2019). 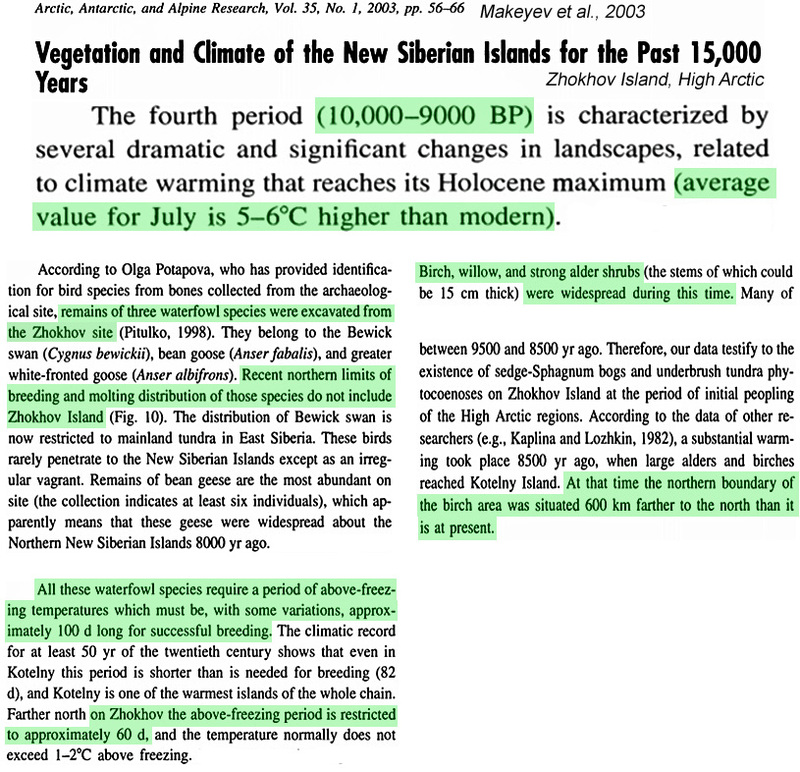 Zhokhov was at least 5 to 6°C warmer than today between 10,000 and 9000 years ago (Makeyev et al., 2003), or when CO2 concentrations hovered around 260 ppm. Other recently published evidence also affirms that the climate of the Arctic was 4 to 7°C warmer than today about 9000 years ago (McFarlin et al., 2018, Mangerud and Svendsen, 2018). In contrast, modern Arctic temperatures are no warmer today than they were in the 1930s. 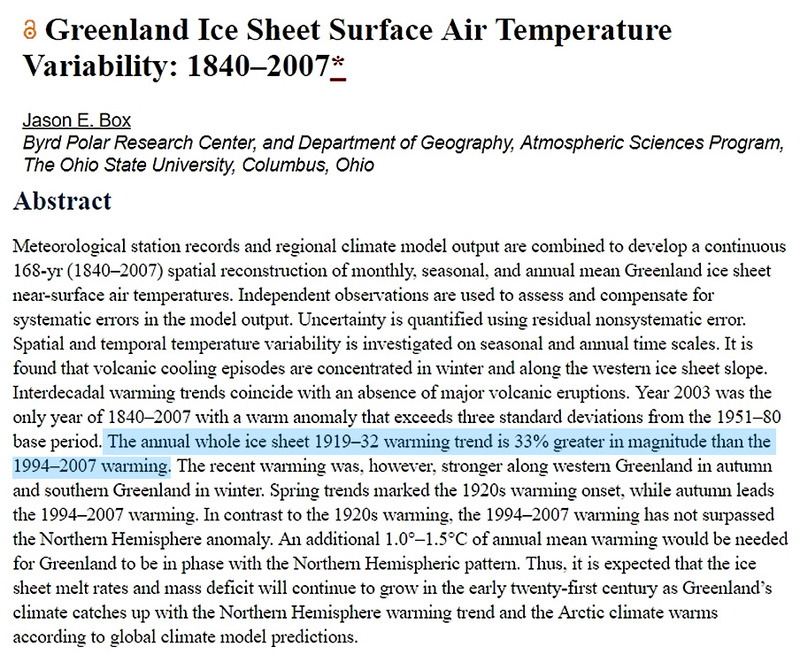 Greenland was actually much warmer during the 1920s and 1930s than in recent decades. None of this climatic evidence supports the popularized contention that the Arctic climate is significantly affected by either the atmospheric CO2 concentration or the rise in human emissions. Artifacts recovered from an archaeological site on Zhokhov Island indicate that the human populations that lived there between about 8250 and 7800 years ago hunted polar bear in the winter and reindeer year-round. They used dogsled technology and the blades they used were made of obsidian, or volcanic glass. To procure obsidian, the authors suggest that the people of Zhokhov necessarily needed to travel extensively to trade with those on the Siberian mainland. The travel distances for the Siberian trade were suggested to reach many hundreds of kilometers. 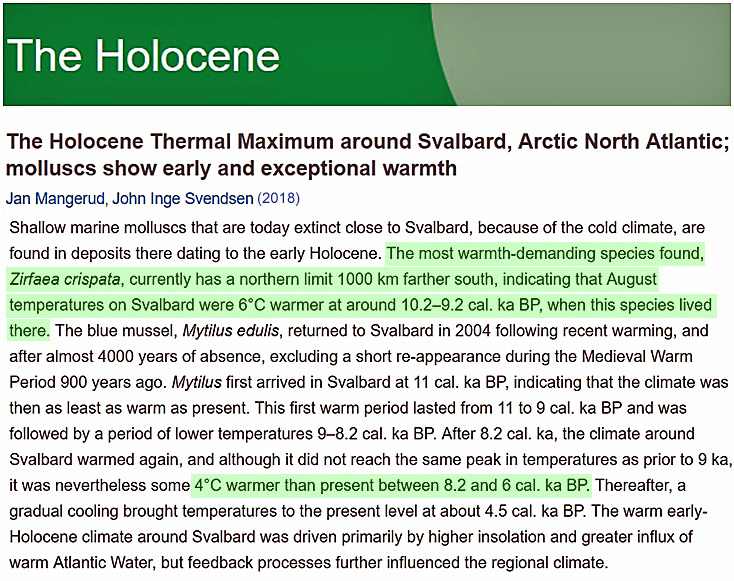 The Holocene optimum was 7,500 to 9.000 years ago… of course it was warmer then. Earth’s Axial Tilt has increasingly been away from the sun. we had experienced 8,000+ years of consistent falling temps as we return to Glaciation. That is Earth’s most Powerful NATURAL CYCLE. Much of the last 1,000 years is called the LITTLE ICE AGE. What Terminated THIS natural cycle in the late 1700’s thru today. Atmospheric Gasses interfering with escaping Earth Infra Red Thermal Radiation to the cold of space. 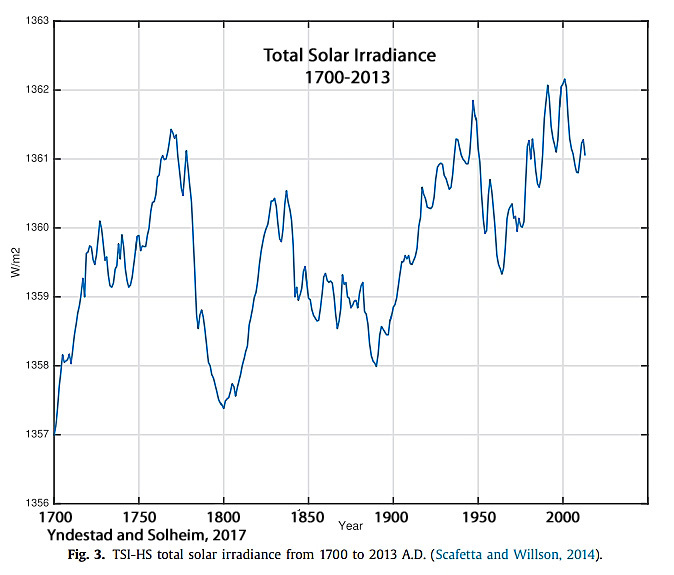 With the last 50 years, where there has been a lessening of solar output…WE SHOULD BE COOLING, DRAMATICALLY ! 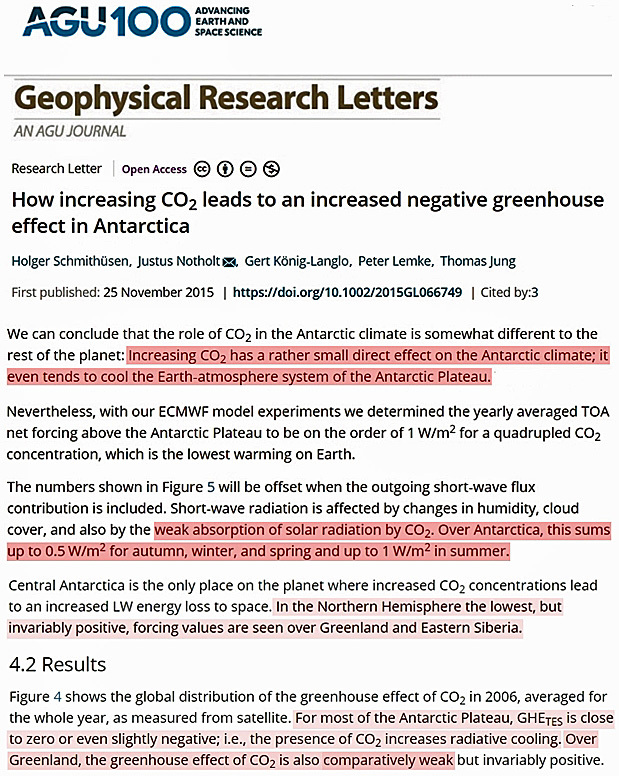 Increasing CO2 concentrations has a “weak” to negligible effect (0-2 W m-2) on polar climates. There is also no real-world evidence or physical measurements that demonstrate how much of an effect increasing CO2 has on water temperatures, and the oceans are where “global warming” is manifested. Since the 1950s, the globe’s ocean temperatures have increased by just 0.1°C, which isn’t even detectable against the background of natural variability. 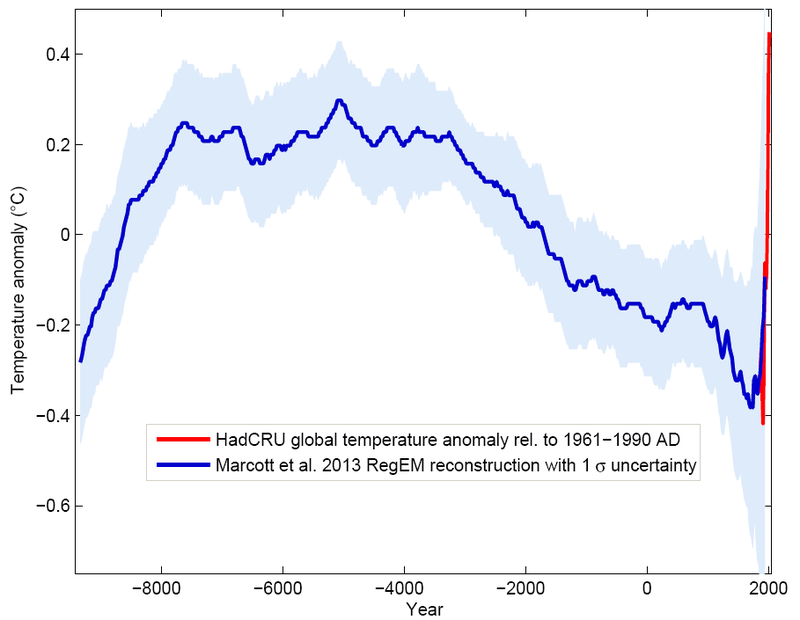 The surface warming of the last century is merely a partial return to the climate “normal” of the last few millennia. The Little Ice Age period was the anomaly. We’ve had a Grand Maximum of solar activity in the last 50 years, peaking in the early 2000s. That said, TSI is not the direct means by which the Sun affects climate. The Marcott graph has been thoroughly debunked as a representation of global temperature changes, even by the lead author himself. The Feldman et al. (2015) paper claims that the 22 ppm increase in CO2 concentration caused a 0.2 W m-2 positive forcing during 2000-’10. The problem is, the Earth’s radiative imbalance was assessed to be 0.6 W m-2 during 2000-’10 according to Stephens et al. (2012), and the uncertainty range for that estimation is ±17 W m-2. 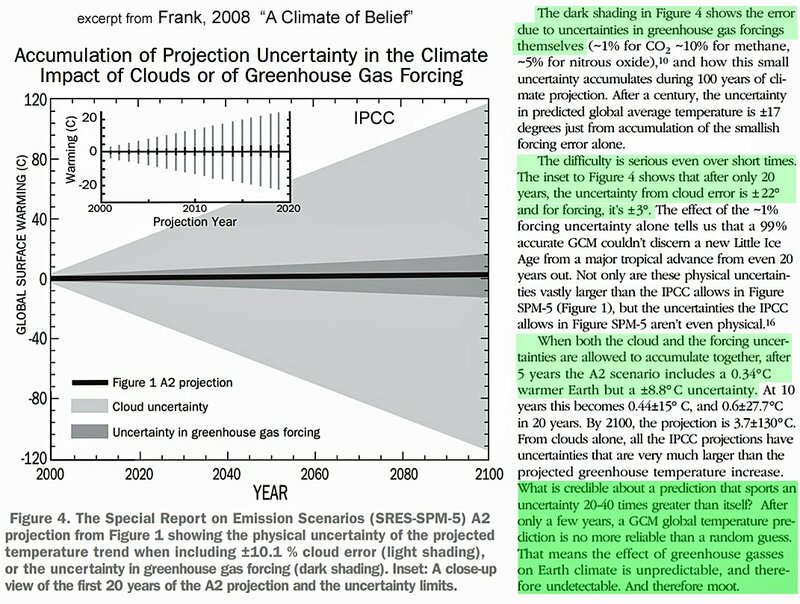 In other words, the uncertainty in Earth’s heat flux/energy imbalance is about 80 times greater than the alleged effect of CO2 forcing itself. So the idea that the Feldman paper “proves” anything ignores the uncertainty/error in any such calculation. For that matter, the temperature predictions by the IPCC have 20-40 times greater temperature range uncertainty than the predicted temperature change from GHGs itself. If you’re going to comment here, you’re going to need something quite a bit more substantive than links to realclimate.org. Real science, not fear-based doomsdayism. Increasing CO2 concentrations has a “weak” to negligible effect (0-2 W m-2) on polar climates. You forgot the little word “direct”. Heat content gets transported around on this planet, the climate of a region doesn’t just depend on the composition of the atmosphere above that region. There is also no real-world evidence or physical measurements that demonstrate how much of an effect increasing CO2 has on water temperatures, and the oceans are where “global warming” is manifested. The surface temperature increased by far more (http://woodfortrees.org/plot/hadsst2gl/from:1950/plot/hadsst3gl/from:1950). Trying to express a rather rapid increase of the heat content as a global ocean temperature change (which is not what is happening), is also a very weak strategy. But please go on believing the cloud cover changes are a result of changing cosmic radiation. As you wrote yourself … solar maximum in the early 2000s. So GCR should have increased since then causing more clouds, not less. Right? 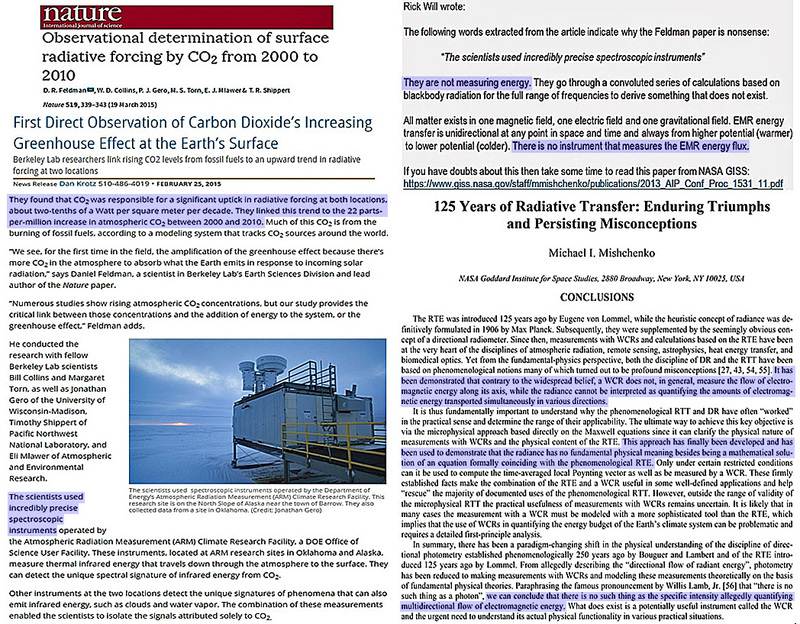 The problem is, the Earth’s radiative imbalance was assessed to be 0.6 W m-2 during 2000-’10 according to Stephens et al. (2012), and the uncertainty range for that estimation is ±17 W m-2. In other words, the uncertainty in Earth’s heat flux/energy imbalance is about 80 times greater than the alleged effect of CO2 forcing itself. […] So the idea that the Feldman paper “proves” anything ignores the uncertainty/error in any such calculation. Umm, I suspect you have no idea how these uncertainties work, do you? So let’s assume you have a voltage meter that has not been calibrated. You have an uncertainty of around 20 V on this meter since you don’t know the exact properties of the components used to build it. So far so good? Question: can you measure a voltage difference of less than 20 V in consecutive measurements with this kind of meter? Is there anything substantive about the replies one gets here? Nothing here proves anything. They are not measuring energy. They go through a convoluted series of calculations based on blackbody radiation for the full range of frequencies to derive something that does not exist. All matter exists in one magnetic field, one electric field and one gravitational field. EMR energy transfer is unidirectional at any point in space and time and always from higher potential (warmer) to lower potential (colder). There is no instrument that measures the EMR energy flux. I had long assumed that the “measurements” weren’t actually measuring the CO2 effect, and this paper from NASA provides the confirmation. Feldman et al. (2015) is nothing more than a mathematical exercise. It doesn’t actually provide “direct” observation of CO2’s effect as it claims. Once again, the bona fides of “climate science” turn out to be fake. Probably not allowed to reply multiple times, but have you ever read the Feldmann paper? They describe what they are doing in detail. How is this news to you? Yes, there are no direct measurements of a CO2 effect in nature since we can’t control the environment by quickly changing the CO2 concentration in the atmospheric column over a region without changing any other variable. What you can do is look at the spectrum. Then you know which molecules are responsible for the insulation effect. 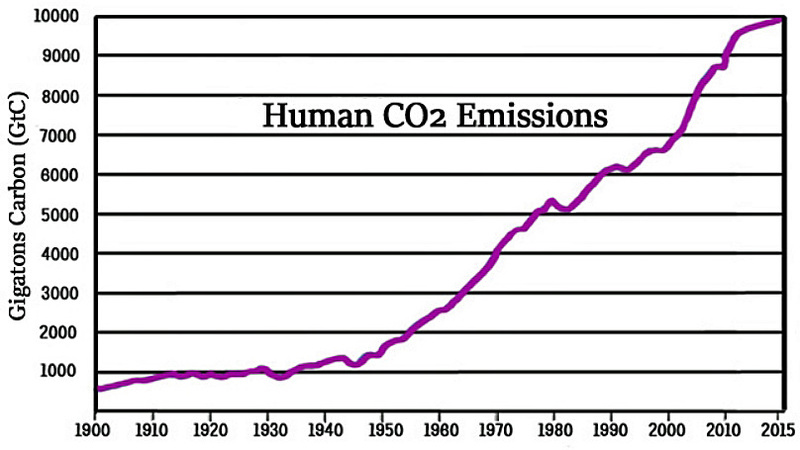 And yeah, that’s – amongst others – CO2. Surprise! The media jump on only the research suggesting (falsely) that we are now at the warmest in the Holocene. 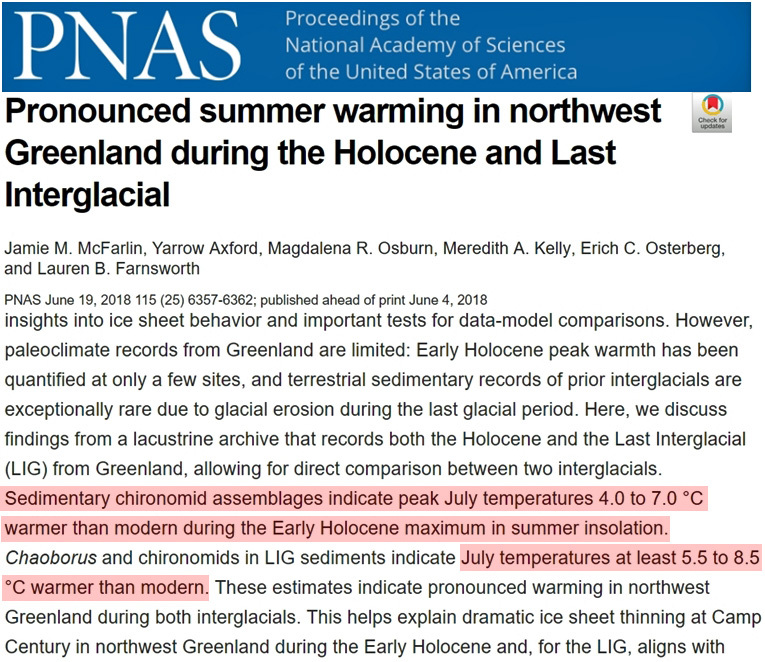 But are silent on such research showing that the Holocene optimum was warmer than now. That’s why it’s called the Holocene optimum. Again it becomes clear that politicised climate science is primarily directed at destroying, not creating, knowledge of the earth’s climate and especially its history. While Pierre and others through websites such as this are doing their best to preserve it. Keep up the good work! According to my calculations, the earth obliquity was at its peak (24,5044°) 8946 years ago. At this maximum, the days are the longest and the summers the hottest. What terminated this natural cycle? It has not been terminated in fact, only in fiction. 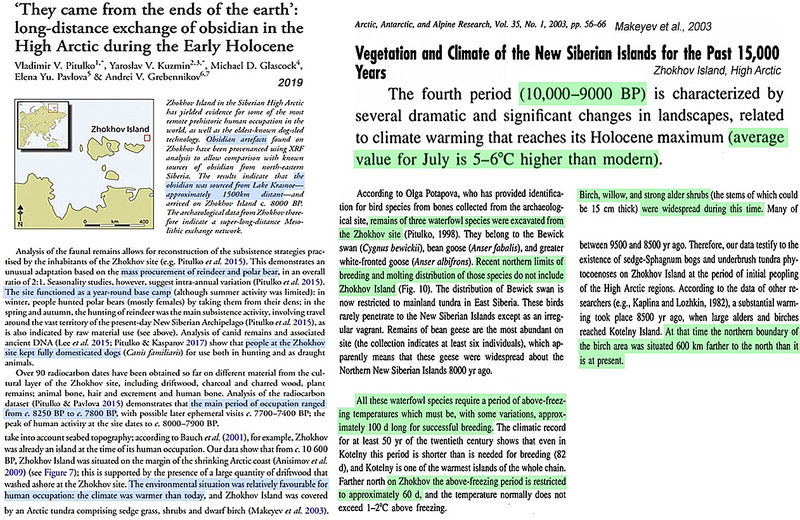 The late Holocene cooling of 4-6 degrees has been partially reversed by brief upward fluctuations in temperature of a degree or so, such as the Minoan, Roman, Medieval and now the modern warm periods. These are minor chaotic variations which are not significantly changing the downward late Holocene trend. warm period (MWP) was not present in the data in the “pre-political” period of climate research before the 1990s. Since then, current warming has been inflated fraudulently relative to earlier and similar warming up-fluctuations. The current century is the coldest of the Holocene. And glacial inception will proceed on schedule. Correction – the current millennium (not century) is the coldest of the Holocene. 1 These gasses ARE NOT ‘DIODIC’. They don’t only interfere with escaping Infra Red radiation.They also interfere with incoming Infra Red Radiation. The ‘interference’ is only involved in a very narrow band of the I R spectrum. 2 The CO2 isn’t voluminous enough to form a ‘blanket’to interfere with all the rays of the radiation – there are more holes than there are molecules of blanket. 3 Water vapor hasn’t been counted as a GHG but is vastly greater than CO2 and ‘interferes’ with heat to a far greater extent in both volume and bandwidth than CO2. So why the focus on one minor gas?